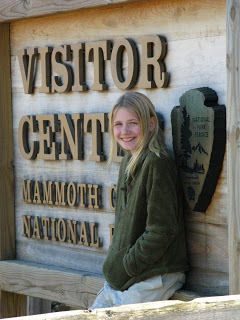 On Thursday morning, we left for Mammoth Cave in Kentucky. It's Mandy's and my fourth straight New Years at Mammoth. Bryan's spent six of the last seven New Years in Kentucky. 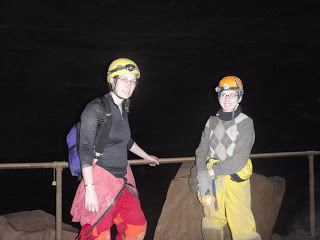 We enjoy the company there as much as we like the caving. As usual, the New Years' party was, well, subdued. There was beer and wine and orange Koolaid. 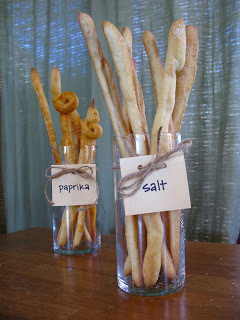 I had made several kinds of crunchy breadsticks to share, and they were set out on the table in clear glass jars along with the things others had brought. 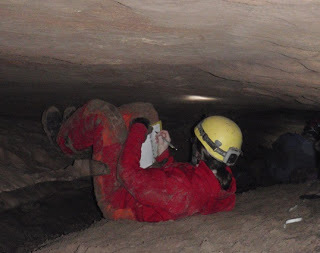 But as the evening wore on, more and more cavers filtered off to bed. By midnight there were only a half dozen of us on the Watsons' old yellow couches in front of the fire, to share Mandy's bottle of sparkling juice and toast the new year. Bryan caved on Friday, with Lynn Brucker, Joyce Hoffmaster, and Jeremy Reedy. They went up Snail Trail to survey in a crawl. He'd just gone to the Goodwill store for expendable clothing, and so was caving in a purple dress shirt and a pair of houndstooth plaid pants. He was sad to find that his cuffed pants had to be tucked into his rubber boots. And he also learned that Snail Trail's not a great place to wear a button-front shirt. It's too bad he's worn out his yellow Meander suit. 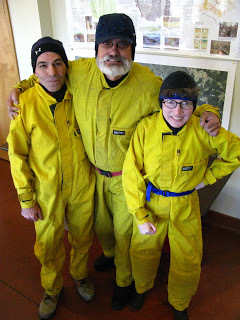 After the cavers were out of camp, Mandy and I hiked with Charles to the Salts entrance. The park has changed all the cores in the locks, and asked CRF to try out the new keys to confirm that everything's working. It was cold, in the mid-twenties, and Mandy broke the ice in all the puddles along the road. Below the trickling waterfall the big cage of a gate was breathing out a great cloud of warm steam. We walked back to camp and then spent the rest of the day on our usual minor aboveground projects (lunch, the visitors' center, the gift shop, and Floyd Collins' grave) before heading back to Hamilton Valley for a nap and to help in the kitchen. From there we continued on to Stephenson Avenue to Opossum Avenue (where there is a set of directional arrows in the ceiling carved by Max Kaemper) and then to Belfry. The passage we surveyed was a close fit, but dry and sandy: curving question marks cut by water into the cool stone. And then we walked, for miles and miles, in the longest cave in the world, past our own history. And then we were back out in the cold night, where it was starting to snow.